Serving Orange County since 1991 with dependable appliance repair in Costa Mesa, CA, Appliances Service Specialists at (949) 610-7585 has serviced over 50,000 homes. Our expert technicians offer affordable repair services for all makes and models of home appliance equipment, as well as heating and AC unit repair. Our repairmen specialize in the repair and installation of quality kitchen appliances, with new parts and service available for range, oven and cooktop repair services. We are open seven days a week and can usually have one of our professional technicians to your home on the same day. With service vehicles fully-stocked with the finest new parts, we have a 90% completion rate on the first visit. If you need refrigerator or freezer repair, call ASSI to handle the job. With a team of repairmen familiar with all makes and models of equipment, we provide reliable washer and dryer repair, including gas and electric equipment. In addition to dishwasher repair, we also offer installation of new or replacement equipment. If your garbage disposer is jammed, call our shop for dependable garbage disposal repair work. ASSI handles microwave repair, including all equipment models. Make sure your ice maker is filtering properly; we offer installation of a new filter, as well as dependable ice maker repair services. No job is beyond our staff. Get the best appliance repair in Costa Mesa, CA by dialing (949) 610-7585 to schedule service by Appliances Service Specialists. Call us today to get your appliance working right. 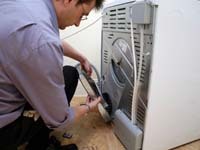 Find Appliances Service Specialists of Costa Mesa, CA on Facebook.